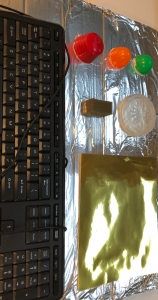 They are really fun and engaging ways to reach the community in the combination of passive programming, adult/child interactions, and thinking beyond the usual story times. It is also an innovative way of reaching all kinds of audiences. My coworker made an amazing rocket ship= U.S. Literacy, that sits atop our display shelf. Floor Planets: Again, my wonderful coworker made the planets to scale and we taped them down on the floor in order that they appear. Hanging Planets: A coworker bought these and it’s an easy and instant decoration. Selfie Station: A blue poster board and some not pictured helmet props are easy ways to get people involved. 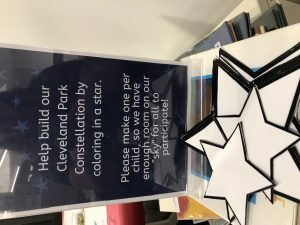 Constellation: Our little ones love to color, so we invite them to color a star to add to our own library constellation. Astronaut Hunt: Not only is this fun, but it’s informational! And a great way to highlight diversity and inclusion of astronauts. We tend to gender them as men or picture white men– but there are lots of amazing astronauts who are from other cultures, ethnicities, and gender. As well as point out some biographies! The nice thing about doing these BIG programs is that you sort of get a routine down. We typically have an all-ages story time with two of us presenting, a craft time, a movie, and then a science/discovery program. Once you have those mapped out, it’s super easy to think of ways to relate them to the BIG theme. All ages story time– I’m pumped to use Greg and Steve’s Space Adventure. Extraterrestrial aliens– some art exploration and then a presentation on what astronauts look for. Want to try them at your library? 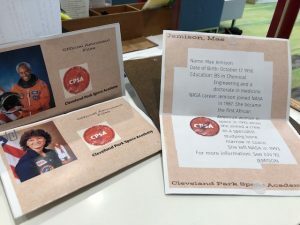 One of the best training I attended, reminded me of the obvious– instead of rethinking community engagement– use your already occurring programs to expand what you aim to do. You don’t need to recreate the wheel— just build around it! We have a bimonthly craft program, so one of them will become a Space craft program. Carry that theme on to your story times and afterschool activities. Build in some passive programs and or decorations- and you are done! I am planning on using SPACE as an inspiration for Toddler Explorations play and sensory weeks. 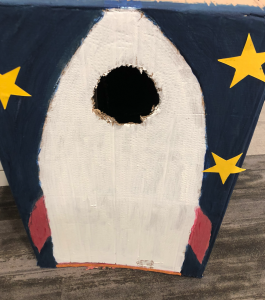 For play- I made a photo book rocket, a control panel, moon rock discovery, and am hopefully borrowing some play tunnels and echo mics to round out the fun! We think of story time as a chance to model early literacy for parents, BIG programming is an invitation to the adults that come into the library to ENGAGE with their children. We provide the template, they fill in the work! Also– it’s really fun! Seeing my coworkers take over different parts and really think outside the box has been delightful. It’s also an interesting way to highlight different parts of your collection… especially, nonfiction topics– which can be a harder circulation area to circulate.